watchOS 4.3 can be downloaded through the dedicated Apple Watch app on the iPhone by going to General --> Software Update. To install the new software, the Apple Watch needs to have at least 50 percent battery, it needs to be placed on a charger, and it needs to be in range of the iPhone. Today's update also reintroduces a much-desired feature that allows music playing on the iPhone to be controlled using the Music app on the Apple Watch. In previous versions of watchOS, starting with watchOS 4, the Music app could only be used to control music playing on the watch itself. watchOS 4.3 returns pre-watchOS 4 functionality and once again allows you to select the music playing on your iPhone from the Apple Watch. With watchOS 4.3, you're also able to control playback and volume on the HomePod using the Apple Watch. Other new features in watchOS 4.3 include a new charging animation when the Apple Watch is placed on the charger and a new app loading animation when opening up an app. You'll also now see your Activity data on the Siri watch face, and the battery complication more accurately reports battery life. 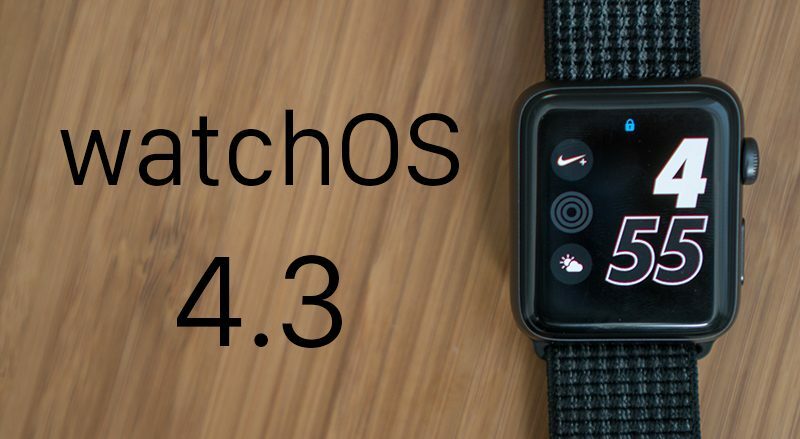 For more on the watchOS 4 operating system, make sure to check out our dedicated watchOS 4 roundup. Will this fix the problem with the Workout app freezing? My Series 3 seems much snappier, I mean its noticeably quicker! Anyone else agree? Maybe Apple finally figured out not to rush updates? How well does the series 0 work with this? I have issues since watchOS4. One could think planned obsolescence. In particular when I start a workout and than try the watch to play music to my Beats X. It's the bomb. It's so much faster and snappier. Wonder if this will fix the lag in the exercise app and the none existent breath reminders? On the Series 2 the speed up for everything is very noticeable and to those that have issues with the workout app it's MUCH faster all around. I agree. Much faster on series 0. The portrait nightstand mode is just bad. Why couldn't they just make the font a little smaller and have the time all on one line. Who reads the time on 2 lines? Presumably so that people with glasses don’t need to put them on just to check the time in the middle of the night. Apple’s trying to substitute a clock radio here. When I was 25, I would’ve scoffed at that notion since I had Superman vision. Bah! Make the font 5 pixels high on that Retina screen. I can read that from 10 feet away. Losers. Then past 40, presbyopia kicks in and you’re like ohh... crap, is this my life now? Damn, never mind. Looking forward to having HomePod controls from my Apple Watch. Sometimes it gets tiring saying "Hey Siri" to the HomePod. I can’t figure out where you can control the HomePod from. Only option I have is to use music on the iPhone and airplay to HomePod. Nothing shows up in the now playing tile. I am so looking forward to the fix for Apple Music. Every time I tried to play music in my car, my watch would just complain that my Air Pods were not available. Then I had to wrestle my phone out of my pocket. Not the safest maneuver.